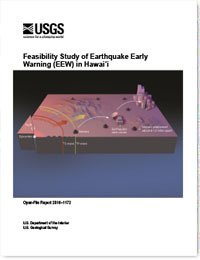 Thelen, W.A., Hotovec-Ellis, A.J., Bodin, P., 2016, Feasibility study of earthquake early warning (EEW) in Hawaii: U.S. Geological Survey Open-File Report 2016–1172, 33 p., http://dx.doi.org/10.3133/ofr20161172. 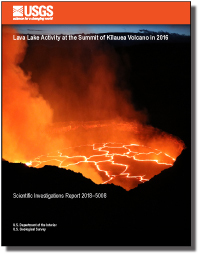 Thelen, W.A., and Cooper, Jennifer, 2014, An analysis of three new infrasound arrays around Kīlauea Volcano: U.S. Geological Survey Open-File Report 2014–1253, 29 p., http://dx.doi.org/10.3133/ofr20141253. Kern, Christoph; Sutton, Jeff; Elias, Tamar; Lee, Robert Lopaka; Kamibayashi, Kevan P.; Antolik, Loren; Werner, Cynthia A.
Patrick, Matthew R.; Orr, Tim R.; Antolik, Loren; Lee, Robert Lopaka; Kamibayashi, Kevan P.
Poland, Michael P.; Takahashi, T. Jane; Landowski, Claire M.; Kauahikaua, James P.; Tilling, Robert I.
Kauahikaua, J.P., and Tilling, R.I., 2014, Natural hazards and risk reduction in Hawai'i, chap. 10 in Poland, M.P., Takahashi, T.J., and Landowski, C.M., eds., Characteristics of Hawaiian Volcanoes: U.S. Geological Survey Professional Paper 1801, p. 397-427. Poland, Michael P.; Takahashi, T. Jane; Landowski, Claire M.; Helz, Rosalind L.; Clague, David A.; Sisson, Thomas W.; Thornber, Carl R.
Helz, R.T., Clague, D.A., Sisson, T.W., and Thornber, C.R., 201X, Petrologic Insights into Basaltic Volcanism at Historically Active Hawaiian Volcanoes, chap. 6 in Poland, M.P., Characteristics of Hawaiian Volcanoes: U.S. Geological Survey Professional Paper 1801, p. 237-292. Sutton, A.J., and Elias, T., 2014, One hundred volatile years of volcanic gas studies at Hawaiian volcano observatory, chap. 7 of Poland, M.P., Takahashi, T.J., and Landowski, C.M., Characteristics of Hawaiian Volcanoes: U.S. Geological Survey Professional Paper 1801, p. 295-320. Poland, Michael P.; Takahashi, T. Jane; Landowski, Claire M.; Tilling, Robert I.; Kauahikaua, James P.; Brantley, Steven R.; Neal, Christina A.
Poland, Michael P.; Takahashi, T. Jane; Landowski, Claire M.
Poland, M.P., Takahashi, T.J., and Landowski, C.M., eds., 2014, Characteristics of Hawaiian volcanoes: U.S. Geological Survey Professional Paper 1801, 429 p., http://dx.doi.org/10.3133/pp1801. Poland, Michael P.; Takahashi, T. Jane; Landowski, Claire M.; Okubo, Paul G.; Nakata, Jennifer S.; Koyanagi, Robert Y.
Paul G. Okubo, Jennifer S. Nakata, and Robert Y. Koyanagi, 2014, chap. 2 of Poland, M.P., Takahashi, T.J., and Landowski, C.M., eds., 2014, Characteristics of Hawaiian volcanoes: U.S. Geological Survey Professional Paper 1801, p. 67-94, http://dx.doi.org/10.3133/pp1801. Poland, Michael P.; Takahashi, T. Jane; Landowski, Claire M.; Cashman, Katherine V.; Mangan, Margaret T.
Cashman, K.V., and Mangan, M.T., 2014, A Century of Studying Effusive Eruptions in Hawaii, chap. 9 in Poland, M.P., Takahashi, T.J., and Landowski, C.M., eds., Characteristics of Hawaiian Volcanoes: U.S. Geological Survey Professional Paper 1801, p. 357-394. 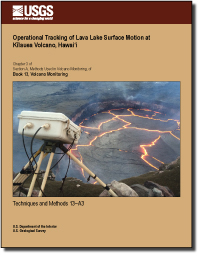 Thelen, W.A., 2014, Seismic instrumentation plan for the Hawaiian Volcano Observatory: U.S. Geological Survey Scientific Investigations Report 2014–5179, 43 p., http://dx.doi.org/10.3133/sir20145179. One hundred years of volcano monitoring in Hawaii; 2012; Article; Journal; Eos; Kauahikaua, J.; Poland, M.
Mauna Loa--history, hazards and risk of living with the world's largest volcano; 2012; FS; 2012-3104; Trusdell, Frank A.